Trade and business groups within and outside Pakistan can make their investment in Sindh, blessed with untapped natural resources and having lucrative potential of investment. Addressing inauguration ceremony of 3-day ‘My Karachi Oasis of Harmony’ exhibition organised by Karachi Chamber of Commerce and Industries (KCCI) at Expo Centre he said Sindh has great potential of investment and we have signed many accords with the national and international companies most of them belonging to China and Turkey. We have started the digging of coalmines and would generate 660 megawatts (MW) power at Thar Coal within three to four years.Many other projects are following to this project though today we were facing acute shortage of energy but in near future the Thar Coal field would be proved as strong power generating corridor of the county. He said in addition there were lot of opportunities of investment, trade and commerce in Sindh and its capital Karachi.Law and order was not the issue of today but it was the problem since many years and current government was giving top priority to maintain law and order and has launched targeted operation against terrorists, target killers, kidnappers and extortionists in Karachi from September 2013. There was no terrorism in Karachi while other criminal activities have been declined up to considerable level. He said after Zarb-e-Azb operation launched by Pakistan Army against the terrorist, the Sindh government has not only endorsed it but devised a foolproof security plan to meet with possible realisation by militants. He offered all facilities, attractive incentives and full protection and asked national and international business community to avail these opportunities under the investment friendly policy of his government. We cannot afford unchecked influx specially from Northern areas in Karachi to avoid any possible entry of the militant in disguise of the displaced persons. He said strict checking was being carried out at all entry and exist points at the border of Sindh and even in the trains as well. 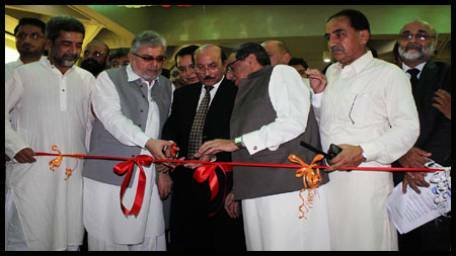 He praised the efforts of KCCI for promoting business activities and this exhibition was instrumental source to promote the trade and business but it was very important for image building of Pakistan and whole nation. He assured the business community for providing full support and protection to them and their business. Chairman Business group Siraj Qasim Teli endorsed the government action against the terrorists and said inspite of the problems of law and order and energy Karachi was being expended and promoted in business point of view. President KCCI Abdullah Zaki welcomed all participants and said it was 11th show of his organisation being attended by national and international companies. Vice Chairman Business group Zubair Motiwala lauded the efforts of Sindh government for eradication of criminals factor from Karachi. He said progress in taxation reflected Karachi was being growing and expending. He lauded the government efforts for utilising indigenous resources for generating electricity. He said due to the efforts of the government, Karachi and Sindh was getting momentum for investment.